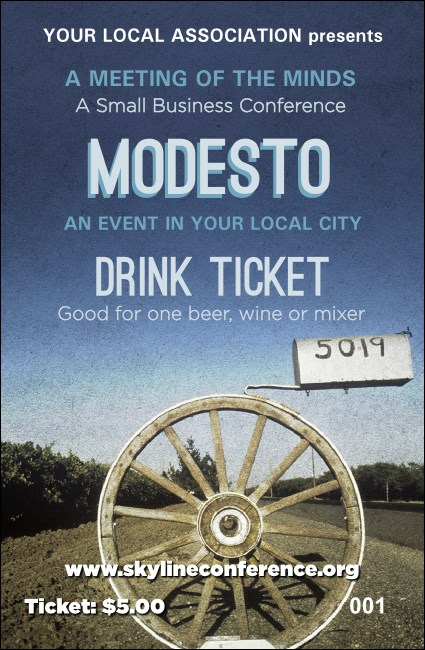 Head west to event success with the Modesto Drink Ticket. Featuring a deep blue sky and a classic wagon wheel, this ticket also has individual numbering for convenience. Whether your guests prefer an Ernest & Julio Gallo Chardonnay or a local microbrew, steer them towards the Modesto Drink Ticket. Don't be modest! Find the right ticket for every occasion at TicketPrinting.com!